What? I can admit it. I’m not always entirely honest with my kids. I mean, I do strive to be as forthright with them as possible. Sometimes, however, a little white lie or two is required. Yo, I’m not trying to be that deceptive; it’s just, on occasion, it’s best for everyone involved to keep B and/or J on a need to know basis. Take the other night, for example, when our house was invaded by monsters. Or more, more specifically, J told us that her room was invaded by monsters. Basically, the monsters were a figment of a four year old girl’s imagination. Nonetheless, J was legit terrified. 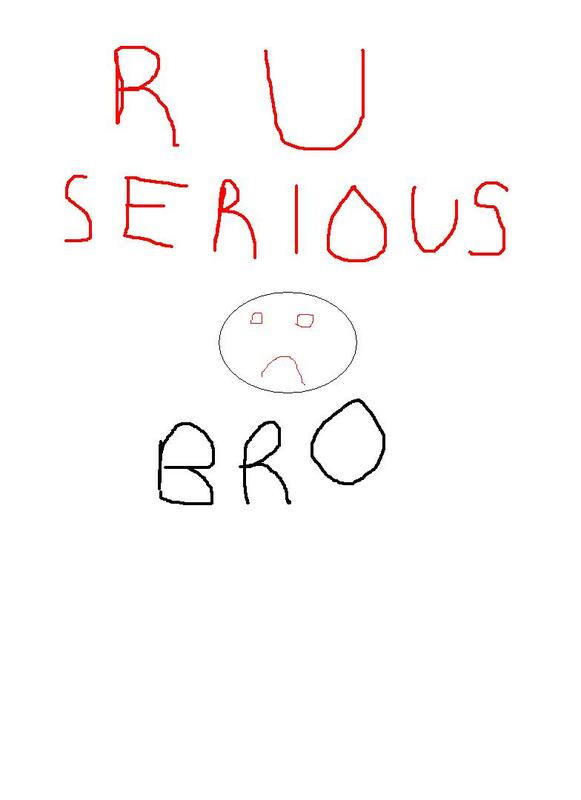 As such, I tried the forthright approach. Monsters weren’t real, I told J. They don’t exist. Unfortunately, she wasn’t buying what I was selling. After arguing back and forth, J asked if we had any monster spray. I then did what any parent who was tired of fighting with their child would have done – I fibbed and said that we did. After rummaging around for a bit, I managed to find some Monster Spray (a.ka. Febreeze with “Monster Spray” scribbled on the label). 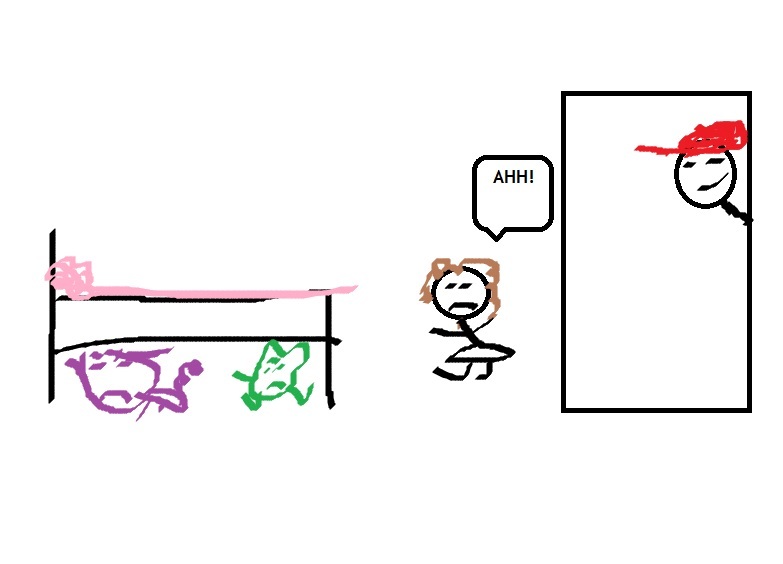 The monsters were under her bed, so I gave them a good spraying, destroying them all. J then crawled under the sheets, went to sleep, and that was that. For real, like 5 minutes later, J came out of her room, insisting that there were now GHOST MONSTERS under her bed, which couldn’t be sprayed. How the heck do you kill a ghost monster?! Let’s flash forward to next night’s bedtime. Hey, don’t be cruel! It was the first thing that came to mind. See, J still believes in stuff like Santa Claus, the Easter Bunny, and, obviously, scary monsters. So I decided to fight her sense of reality, with her sense of reality. After I grabbed Elvis, I took J to her room, and improvised the “story” of this particular doll. Back in the day, after I moved out of our old home, my mom also moved into a new place on her own. Being alone for the first time in her life, she was scared. That first night, she couldn’t sleep, because she was afraid of monsters and creepy things in her bedroom, just like J was. 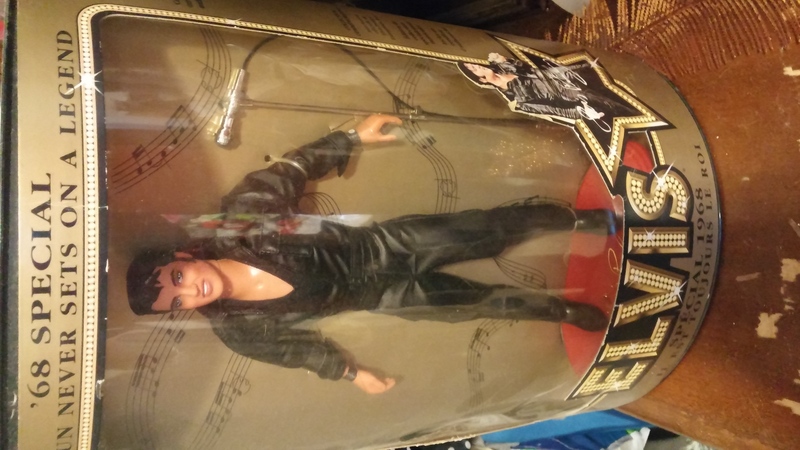 So, the next morning, she went to a special store and bought this Elvis doll. It had secret powers that protected you at night from bad things while you slept. 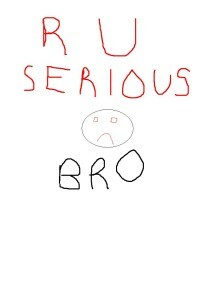 I reminded J of how when we used to go visit grandma, she still had this by her bed. I wasn’t sure how it worked; maybe he came alive at night and fought off the monsters, who knows. All I know is that we never saw anything scary at grandma’s place. After my mom passed away, I took Elvis and kept him tucked away, in case his powers were ever needed again. I placed Mr. Presley high in J’s closet, and told her that if she ever felt scared that night, then all she had to do was look at Elvis, and remember that her, and grandma, would keep her safe. As I told her this tale, J’s eyes were wide, like I stepped on her blue suede shoes. She totally believed me, though (no suspicious minds here), and fell asleep in her bed not long after. Aight, aight. Perhaps I exaggerated the details a wee bit. I’m a liar, I already admitted that. Truth be told, I never asked my mom what the deal was with Elvis. 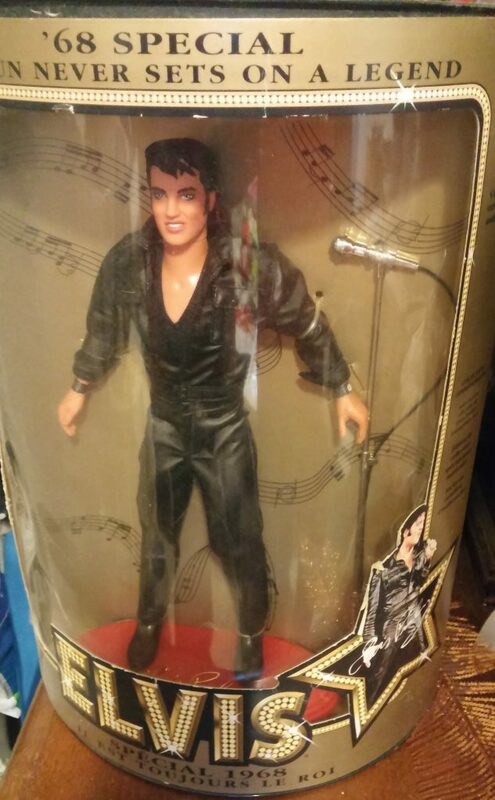 He was her favourite singer, and this doll was randomly displayed prominently in her bedroom. I’m sure the real story behind it wasn’t so crazy…..but what if it was? Regardless, for one night anyway, Elvis Presley saved me a ton of drama. And for that, I say thank ya. Thank ya very much. Well, another Halloween is in the books. 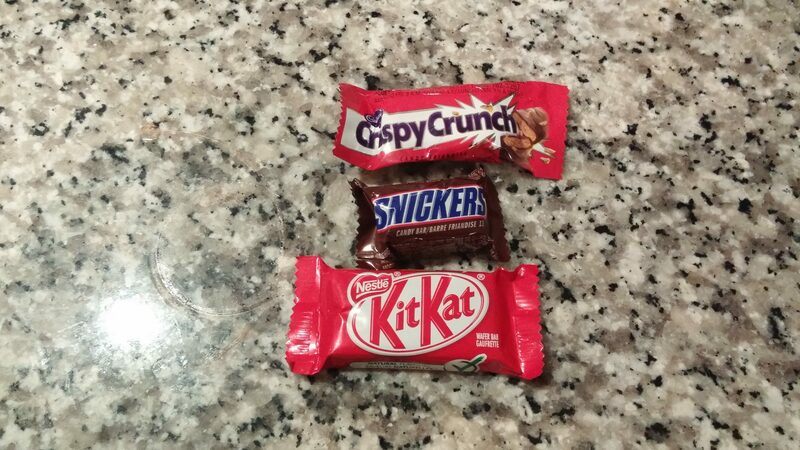 This year, B and J (dressed as Drake and a rocker girl, respectively) had a blast trick or treating, and came home with a pretty good haul of goodies. 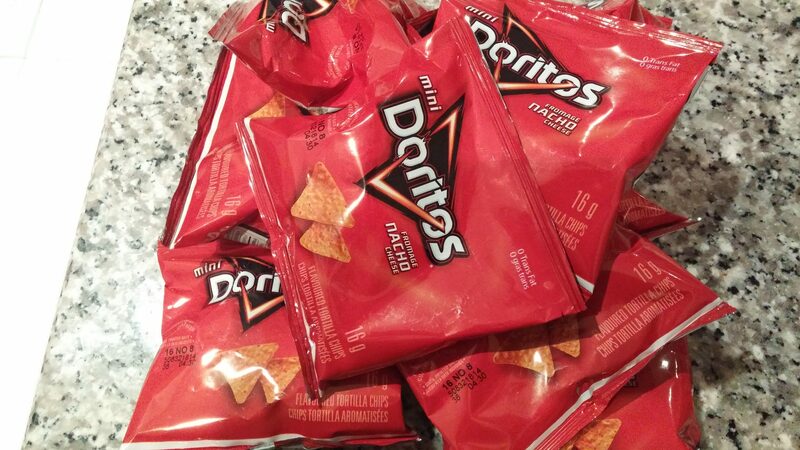 Mounds of junk food, for real. 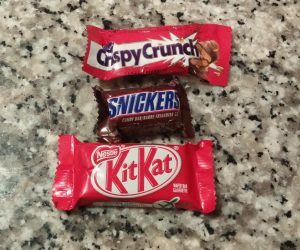 One thing that I noticed was that some treats were better received than others. Uh, not just by B and J, but by me, too. As such, I figured I’d rank them. Consider this the top 10 Halloween treats that my kids got this year. There’s no real criteria; it’s just based on my own subjective, unintelligent, unreliable opinion. Ok, let’s get our Ryan Seacrest on, and count ’em down! 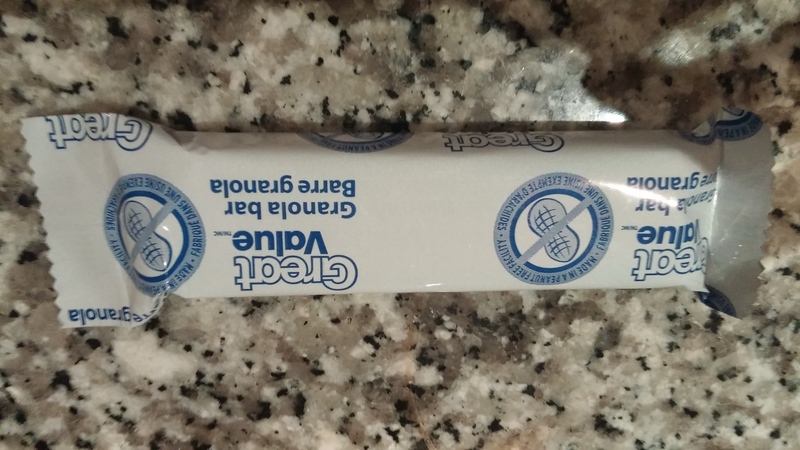 Coming in at number 10 is a good ol’ granola bar. While not as exciting as the other contenders, it does have its charms. For example, it’s probably not that unhealthy, so it can be used in candy negotiations (ie. “Daddy? Can I have a chocolate bar?” “No! No more junk. 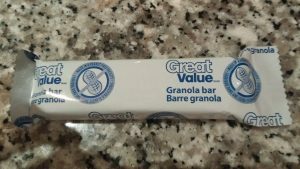 Go eat a granola bar or something.”). 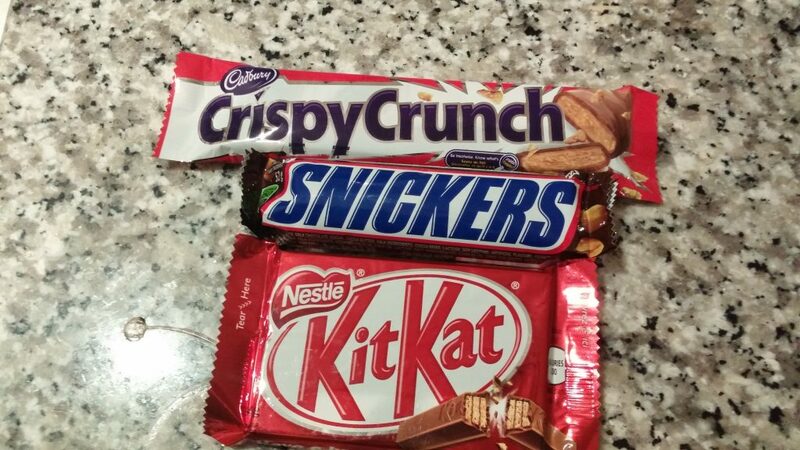 Plus, since nary an apple was found in any of the loot bags this year, it’ll have to do, as the only nutrional option. 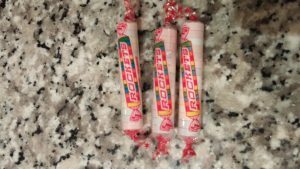 Conversely, let’s talk about Rockets. These sweet tasting packages of sugar tablets have little in the way of nutritional value. 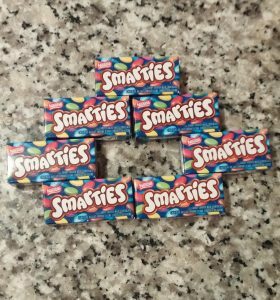 However, they are a favorite among the kids, since they are sweet tasting packages of sugar tablets. The only reason that they aren’t higher on the list is because of J’s habit of playing with them and pretending they’re medicine. The idea of a little girl and her stuffed animals play-popping pills is kind of weird, what can I say. Don’t get it twisted, American readers. 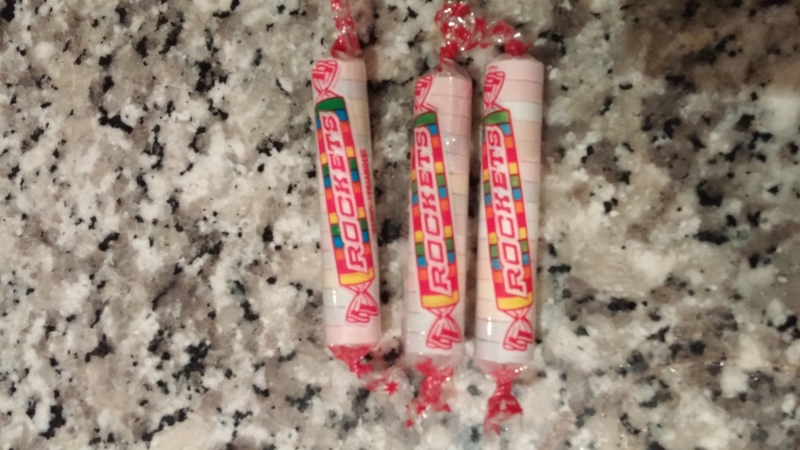 What we call Rockets up here in Canada, you guys call Smarties down there. Our Smarties are multi-coloured, candy-coated chocolates, however, and are, as the kids say, da bomb dot com. 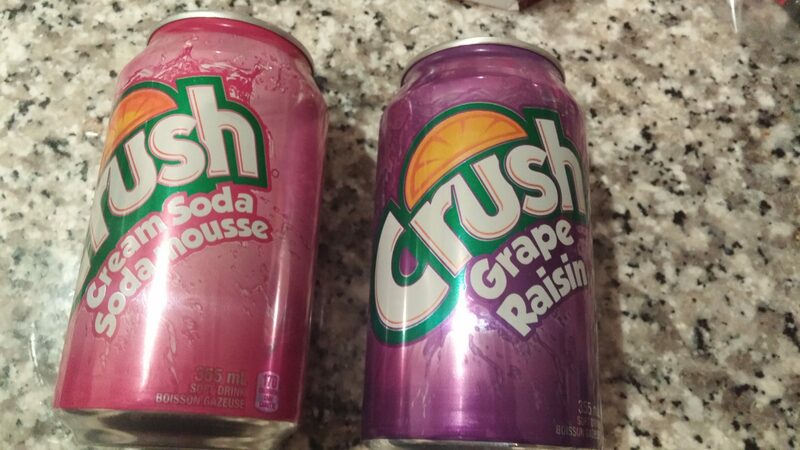 Oh Canada, indeed! I have no idea if B and J even like these. When I saw them in their bags, it made me think of that Lil Kim and Sisqo song “How Many Licks”, so that counts for something, right? 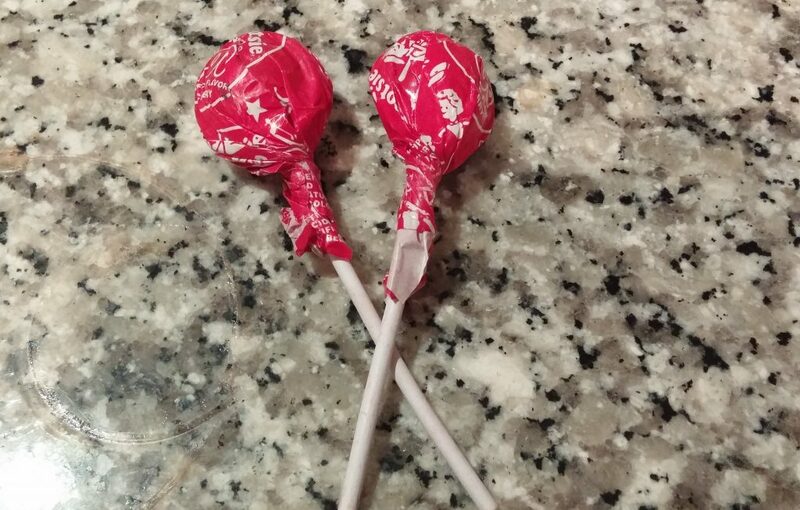 Pretty sure that song wasn’t about Tootsie Pops, though. 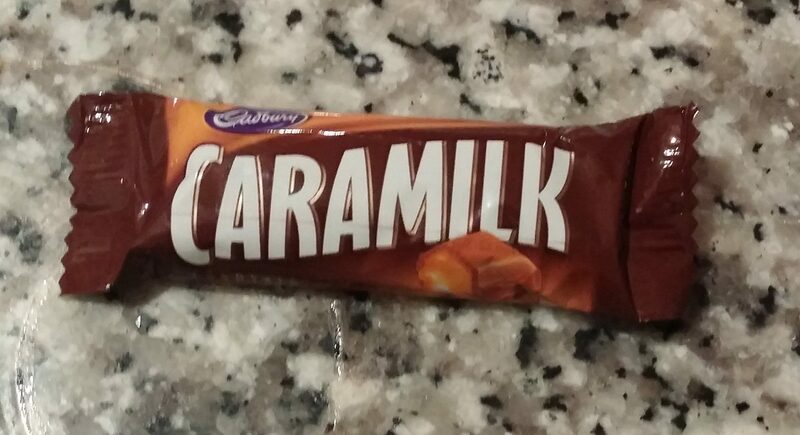 Another Canadian specialty. 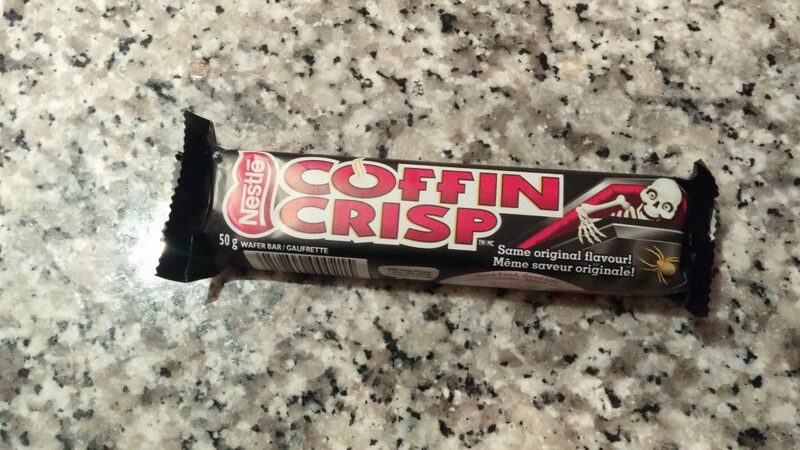 This is a bite sized, Halloween-themed Coffee Crisp chocolate bar. Big ups for getting into the holiday spirit! 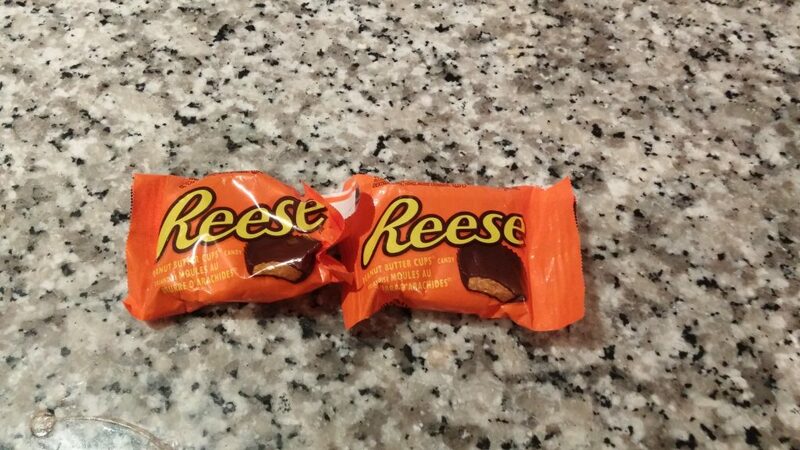 In fact, the only thing better would be if the kids somehow got these full sized. Sweet! Hey, that was kind of fun. Let’s do that again! OK, now turn it up! 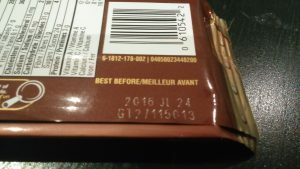 This expired in July? 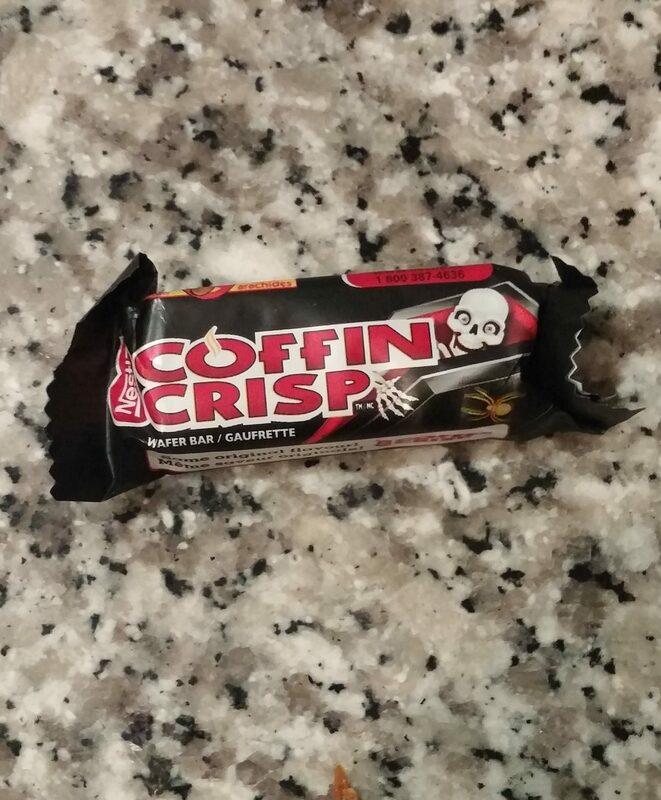 Who the heck gives out expired candy on Halloween?! That’s cold like Minnesota, yo. Man, I need a new number 4. Perfect. Cheesy, nachoey goodness. 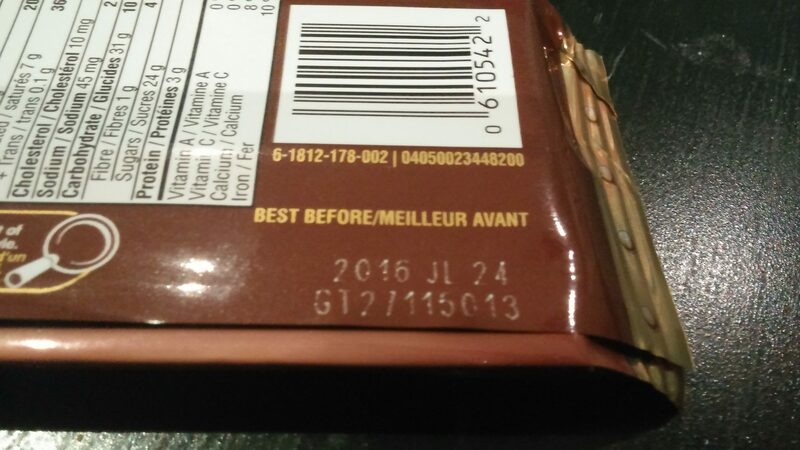 And most importantly, not expired. 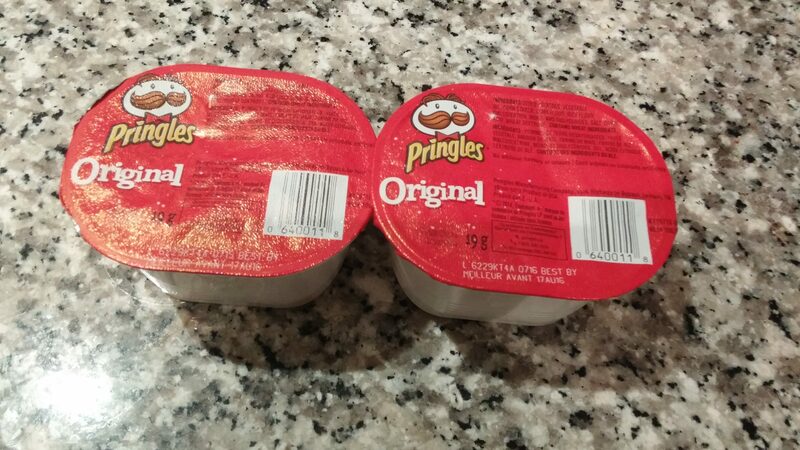 Potato chips are always a hit, but the kids seemed to really like these mini Pringles cans, to get their salty fix. My personal favorite. The only reasons that they aren’t number 1 is because when they are left in less than ideal temperatures, they melt, creating a gooey mess which the kids still eat, resulting in gooey messy children. And that’s that. Peace out, starboys and stargirls. I hope your Halloween was as spooktacular as ours!